Tabula Rasa is a Remote Control Editor app that allows you to create your own Virtual Remote Controls and functions and share them online with the rest of the world, if desired. You can learn IR codes or search our database of IR codes. You can also control your PC or Mac. Tabula Rasa is the "Blank Slate� on which you can create your own master-piece remote control. The iWavit Flow app is the "One Remote To Rule Them All, and In The Darkness Bind Them". Swipe your finger across the screen to quickly thumb through cover-flow art of all your different iWavit remotes, or select ALL REMOTES to browse through all the iWavit Remotes that are currently available on the App store. 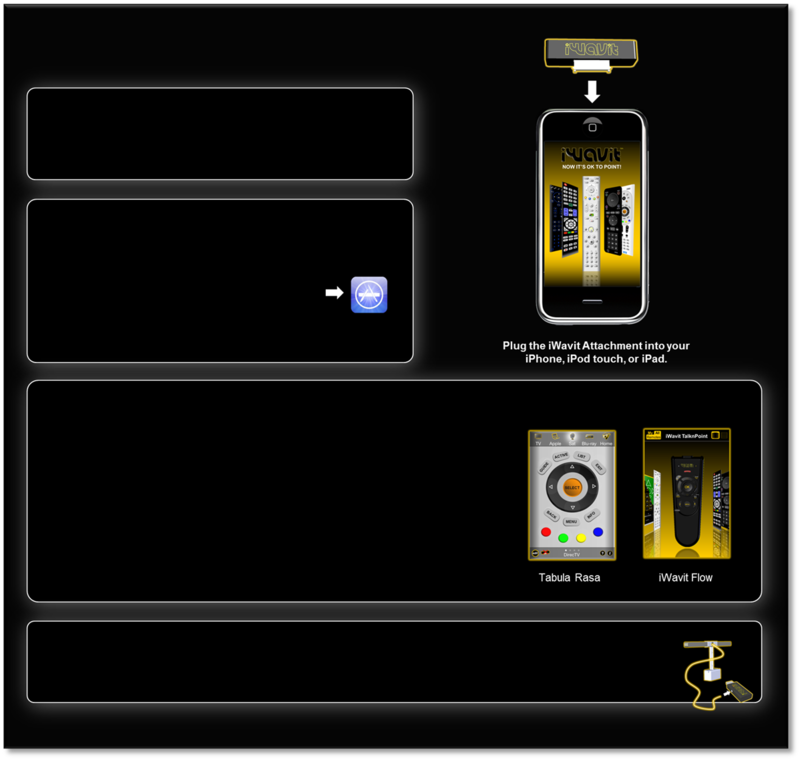 Check out our other apps here, and learn more about the Virtual Remote design concept here. The iWavit Premium also comes with the IR Extender capability. With the USB dongle plugged into any powerd USB port (or USB wall adaptor) you wont have to point at your IR devices anymore to control them, You can will be more than 300 ft away from your TV and still control it. Read more here. Step 1: Plug the iWavit Attachment into your iDevice. Step 2: Go to the App Store on your iDevice, and search for iWavit. (or use iTunes on your Computer and then sync your iPhone). Step 3: Select from one of the pre-made iWavit Remote Control apps, or go straight to iWavit Tabula Rasa, the ultimate Remote Control Editor. The iWavit will allow you to turn your iPod touch, iPhone, and iPad (iDevice) into the Ultimate Universal IR Remote Control with the ability to choose from many "pre-programmed" remotes, or to build your own perfect Remote and learn IR codes. This may very well be the last remote you will ever need.